The Magazine Advertising Fee Table (雑誌広告掲載料金表) published by the Japanese Magazine Advertising Association provides demographic statistics for the readership of Japan’s major fashion magazines, breaking down geographical spread by individual prefecture as well as larger regional area (i.e., Kinki, Chubu, Kanto, Tohoku, etc.). In order to understand the regional biases of fashion in Japan and which magazines (and subsequently, which fashion market segments) are “regional” and which are more “Tokyo,” we first have to compare each magazine’s readership distribution against the national population distribution to locate the areas of over- and under-representation for certain titles. We used official population statistics from 2003 in the following analysis. 1) Fashion is primarily an urban phenomena. No surprise in that statement, but the high-population density, relative wealth, and high media usage for urban populations creates the much deeper needs for living up to the proper fashion standard that drive magazine readership. 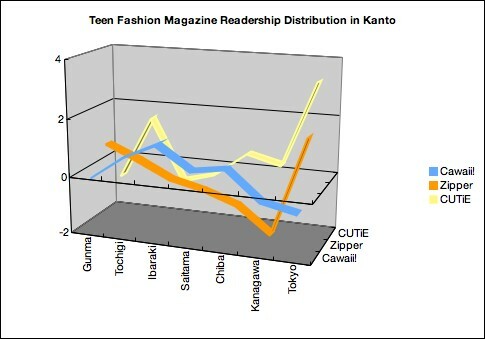 As a result, most fashion magazines are generally biased towards a Kanto/Tokyo readership. 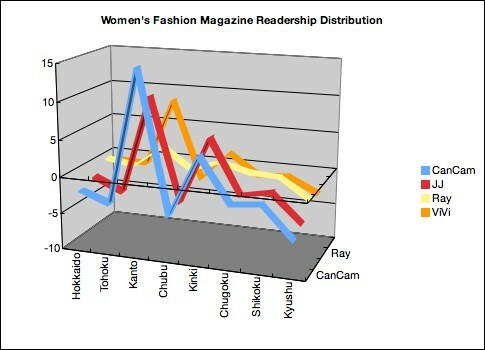 Fashion magazines with readership distribution similar to the total population (a flatter line on the graph) are relatively non-Tokyo in focus. 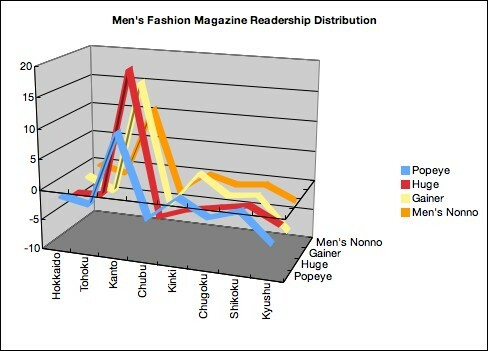 2) Fashion magazines for men are more Tokyo-centric than those for women. In general, men’s fashion magazines have significantly lower readership than women’s fashion magazines, and the males who show high involvement with fashion appear to be primarily located in the Kanto area. That being said, there are regional differences — with Tokyo men being more interested in high-fashion than their counterparts in the country. The “hi-end style magazine” Huge has over 50% of its readers just in the Kanto area. However, a “rougher” and more masculine magazine like Men’s Joker has only 26.2% of its readers in the Kanto area. On average, however, men’s magazines have greater Tokyo-centered readerships than their sister publications. 3) Fashion magazines become more Tokyo-centered as the average readership age increases. Adolescents have little in the way of personal mobility, but those in their 20s and 30s who have an interest in fashion or have jobs requiring more fashion sensibility are likely to relocate to the urban centers (especially Tokyo) after graduation from high school, university, or trade school. CanCam, for example, is directed at office ladies in their early 20s at large companies, and needless to say, these firms are mostly located in Japan’s big cities. The magazine’s readership spikes around the main urban hubs of Kanto and Kinki. Despite such a limited geographical appeal, however, CanCam is still the best selling female fashion magazine. This reiterates our obvious insight that “fashion is an urban phenomenon,” but it’s important to not to overlook how much consumer needs for fashion weaken for women in rural areas once they reach their 20s. It is also important to note that women’s access to the brands featured in CanCam or JJ decreases as they move away from urban areas, although internet retail sites like FashionWalker.com are dramatically changing this. 4) Readership distribution for teenage girls matches general population distribution, but there are regional differences in style. 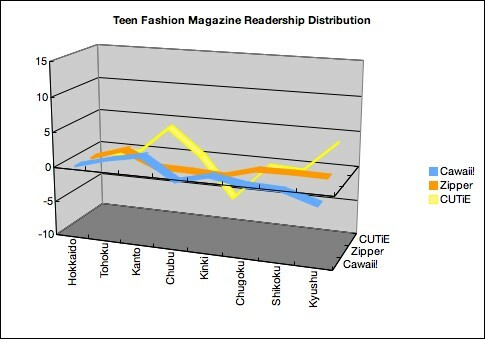 For the teen fashion magazines featured in the bottom two graphs, readerships of all three stick very close to the national distribution average — meaning they are relatively un-Tokyo-centric compared to the magazines for older women. The “gyaru” look of Cawaii!, however, tends to be even less urban than the more artsy style represented in CUTiE and Zipper. The gyaru look does relatively well in Kanto, but underperforms in Kanagawa and Tokyo (see the bottom graph) — which are understood to be the most expensive residential areas in the region. This lends credence to the stereotype that “gyaru” fashion is primarily a lower class subculture. The colorful alternagirls of CUTiE have much greater presence in Tokyo but this look has almost no traction in the Kinki/Kansai region. While the Cawaii gals seem to be living in the less wealthy suburbs outside of Tokyo, the CUTiE readers increase in proportion the closer you get to the capital. This entry was posted on Tuesday, June 5th, 2007 at 5:00 pm	and is filed under Clast, Fashion, Magazines, Media, Women's Fashion. You can follow any responses to this entry through the RSS 2.0 feed. Both comments and pings are currently closed.